Newly declassified documents reveal not just the US government’s “detailed knowledge” of the Indonesian Army’s mass killings of members of the Communist Party (PKI), but its “active support” of the slaughter. The documents, posted Tuesday by the National Security Archive at the George Washington University in Washington, DC, show that US officials “actively supported Indonesian Army efforts to destroy the country’s left-leaning labor movement,” according to the independent research and archival institution. The 39 new documents, from a cache of some 30,000 pages of daily record files taken from the US Embassy in Indonesia’s capital from 1964-1968, were declassified and digitized in collaboration with the National Declassification Center. The move came following a growing number of requests from US and Indonesian human rights groups. The files include State Department letters, telegrams, situation reports and confidential communications between US consulates and the US embassy. However, the cache does not include any CIA documents, which remain classified. Human Rights Watch has called for all remaining files to be unclassified. The new material showed that US diplomats in the Jakarta embassy and their State Department counterparts in Washington kept a record of which PKI leaders were being executed during one of the most turbulent times for Indonesia, following its independence from the Netherlands in 1949. 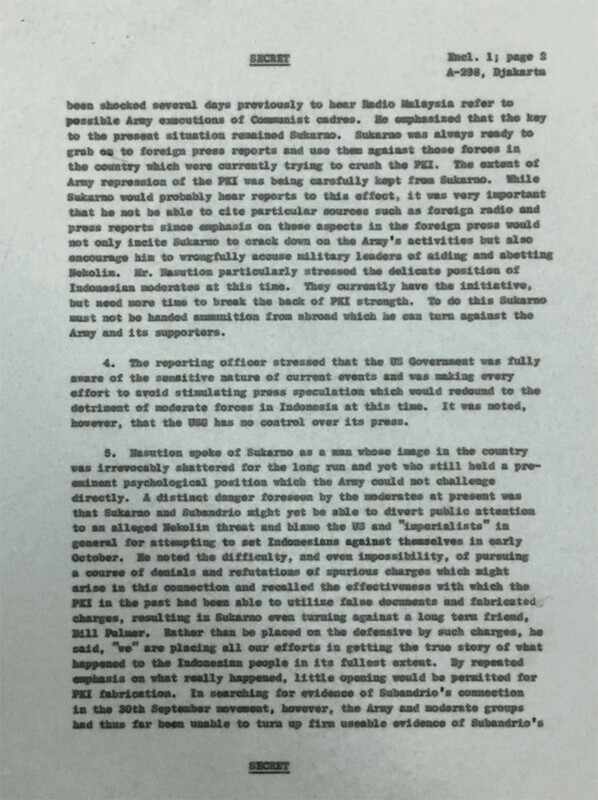 Particularly damning is the memorandum of a conversation between Second Secretary of the Embassy Robert Rich and Assistant to the Attorney General Adnan Buyung Nasution in October 23, 1965. It’s one of the earliest mentions of the systematic killings to Washington. The telegram recounts the nation’s cooperation to keep reports of the killings from the international press so as not to alert Indonesian President Sukarno. “The army had already executed many Communists but this fact must be very closely held” while they “continue to crack down on the Communists in order to break the back of the PKI power,” wrote Nasution. In the memo, Nasution voices his “shock” at reports of the killings that had begun surfacing on Malaysian radio and warned that Sukarno must not learn of the army’s repression from foreign media. Another ‘Secret’ cable to Washington, DC from Embassy First Secretary Mary Louise Trent in December 1965, notes the “striking Army success” of its efforts to accumulate power. “[Anti-PKI violence] have now resulted in an estimated 100,000 PKI deaths. A reliable Balinese source informed the Embassy that PKI deaths on the island of Bali now total about 10,000 and include the parents and even distant relatives of crypto-Communist Governor Sutedja,” it read. The files document a time when tensions between the Indonesian army and the Indonesian Communist Party boiled over, resulting in an almighty ‘purging’ that killed hundreds of thousands of its citizens. 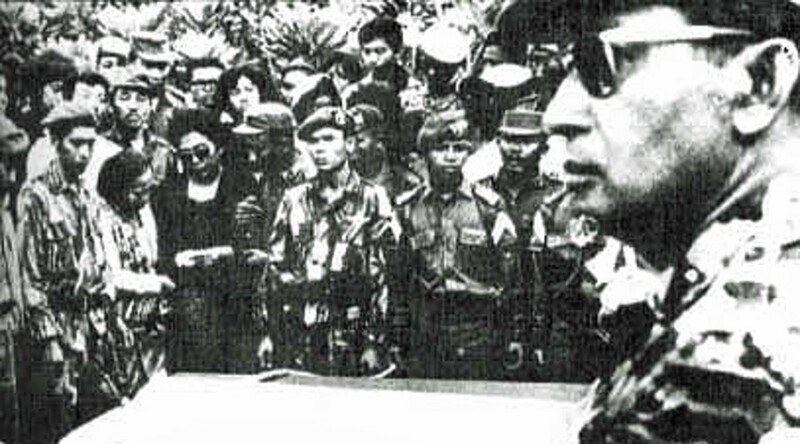 After seizing power over the Indonesian military in September 1965, General Suharto launched an army-sponsored massacre of the very large, but mostly unarmed PKI membership, citing reasons of “political contamination.” He would eventually topple Indonesia’s first President Sukarno, in 1967. The Australian embassy in Jakarta estimated that at one point there were “about 1,500 assassinations per day” and two confidential Western agencies agreed on “a total of about 400,000 killed.” However, a deputy US ambassador thought that the full toll could be much higher. It’s estimated by the NSA research group that up to 500,000 alleged PKI supporters were killed between October 1965 to March 1966, and up to a million more imprisoned. Suharto ruled Indonesia until 1997.